Daily Illuminator: Now Shipping Munchkin The Guild And More! 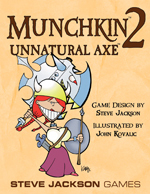 May 22, 2012: Now Shipping Munchkin The Guild And More! This month we have two fun Munchkin releases. The new Munchkin booster is based on a hit series starring Felicia Day. Want new Munchkin Cthulhu cards instead? The new Munchkin Kill-O-Meter comes with two new cards! We also wanted to point out a few reprints that are now available. Now they've come together in a glorious spew of AWESOME, with the new 15-card booster, Munchkin The Guild! Add Codex, Vork, Clara, Bladezzz, Tink, and the mighty Zaboo to your adventures. You may meet some of their foes along the way . . .
Finseal pack containing 15 cards. Stock #4230, UPC 837654321539. $5.95. One two-sided combat counter and two Munchkin Cthulhu cards. Stock #5540, UPC 837654321461. $6.95. With GURPS, you can be anyone you want -- an elf hero fighting for the forces of good, a shadowy femme fatale on a deep-cover mission, a futuristic swashbuckler carving up foes with a force sword in his hand and a beautiful woman by his side . . . or literally anything else! 336 pages. Hardcover. Stock #01-0001, ISBN 978-1-55634-729-0. $49.95. Illuminati was an instant hit when it was released in 1982 and won the Origins Award for Best Science Fiction Boardgame. It has been Steve Jackson's signature title ever since. 112 more cards for the game of killing monsters and taking their stuff. Play a new race: Orcs! Face foes like the Hydrant and the Tentacle Demon. Equip yourself with dread armor like the Spiked Codpiece. Recruit allies like the Shoulder Dragon. Wield mighty weapons like Druid Fluid, the Slug Thrower and, of course, the dread Unnatural Axe . . . and show them who's the greatest munchkin of all.